Jack Black in School of Rock once said, one great rock show can change the world! I guess the same principle applies for networking industry: one great product can really change the world. When Cisco Systems developed the first commercial router for public use, it was intended to serve multiple protocols. There was no intention to split the products for a different segment, for example between Service Provider and Enterprise network. The result at that time was a full line of products without clear separation in the products specification between a different market segment. They were all running the same legacy IOS and every product can support the full set of features whether it is required or not. Thankfully Cisco realized that there is no one product to serve all. A classified project was started at the end of the 90's to come up with the next generation router with the new hardware architecture and the new software. When Cisco CRS-1 was unveiled in May 2004, it can be seen clearly that this product is the answer of the requirements from service providers to have a robust, high performance and scalable core router. And the product that just celebrated its five year anniversary last month continues to beat the expectation and currently has been deployed in more than 300 providers in the world. So once you have a successful product, what's next? Try to replicate the success story and the technology for another products, obviously. The proven hardware architecture and the new true-modular IOS XR have been re-used in other products including the new release Cisco ASR9000 series. I'm very excited about this product because not only Cisco was able to release it during global financial crisis time (there are few products that have been developed for years but must be canceled due to the crisis, and we may need to wait until the financial situation recovers for new inovation) but ASR9000 comes with the similar hardware architecture with CRS-1 that has been proven in many production networks. Enough with the history lesson, here comes the main point of my writing today. As we all know the demand of Video services has become the main factor of so many technology developments. We live in High Definition era where even DVD quality is not enough. And we all want the video to be delivered to our TV at home through the network. We used to be grateful to YouTube, but now we want more. We ask for higher quality. We want for a full movie. We want to be in control of when and where we want to watch the movie. It has to be available anytime, anywhere, as long as we are connected to the network. This means we need a high performance network infrastructure to deliver the video services. We need to ensure the digital packets of the video can be switched as fast as possible. We need more storage to keep all the videos. And not to forget the Video traffic must compete with other type of traffic in the network. This means the Quality of Services must be enforced for different type of network traffic to guarantee the services. The Buggles were not wrong when they said Video Killed the Radio Star. But these days Video also kills our bandwidth, chokes our routers, and fills up our storage quickly. And Cisco is the leading company that has a complete line of products that are proven to deliver the Video service end-to-end. While other companies are still busy marketing how fast they can bring new independent features to the market, Cisco has done more. They not only can cover all the required products to build a complete solution, they also show how to do it with a proven test result conducted by third-party testing vendor. Light Reading and EANTC just released a report yesterday on how they test the Cisco's IP Video Services Delivery network. The tests covered the high availability with sub-second failover time for all network services, in-line video quality monitoring, massive scalability of IP video services and storage area network solutions and virtualization. 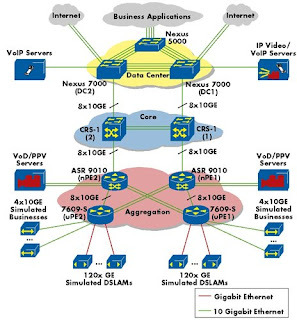 The products involved are Cisco CRS-1, ASR9000, Cisco 7600-S, and Nexus. As I said once, TV is evil. But on-demand TV is not. Simply because now we are in control of our TV. Take control your TV. Take control your life.